If anything illustrates the generation in which we now live it would be a bowl of Jell-O; sweet, but with no real substance. 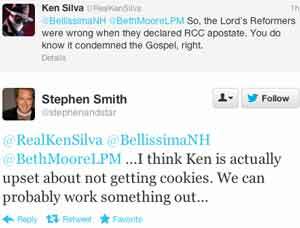 Apprising Ministries has been warning you of growing syncretism and sinful ecumenicism, e.g. 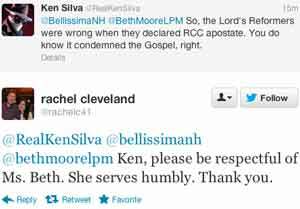 Southern Baptists Assist The Roman Catholic Church To Infiltrate Evangelicalism. Hall is dead-on-target; the SBC is experiencing a growing apostasy. He’s also right about many Moore-ites and their almost blind obedience to whatever whims she claims God has Personally shown her via direct revelation. 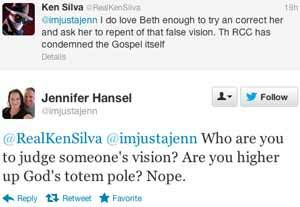 One of these “visions” is the subject of this piece stemming from my interaction with Beth Moore yesterday. As someone who’s long dealt with the neo-liberal cult of the Emergent Church aka the Emerging Church with its postmodern Progressive Christian theology—a Liberalism 2.0—that they often refer to as “big tent” Emergence Christianity I can tell you Moore’s answer is identical to what former EC rock star Rob Bell would have said. I said nothing at all about any individual Roman Catholics; i.e. I wasn’t judging anyone’s salvation, so that’s actually irrelevant. I also didn’t make any comment about serving anyone; so either Moore’s critical reasoning skills really need to be sharpened up, or perhaps she’s intentionally engaging in obfuscation here. As far as, “We are blatant about how to be saved, Sir,” I have no idea what that sentence even means. I don’t think it can refer to her Gospel presentation because the very few times I’ve ever seen her give one it’s been the typical evangelical synergistic “decision” evangelism. That’s hardly what we could call blatant. Again, the Emerging Church apostates have been singing this tune for years now; however, again we’re not talking about individual people. We’re talking about the Roman Catholic Church itself; an institution that has anathematized the Gospel. You’ll see in Has The Roman Catholic Church Really Changed, the answer is: No. Notice in it’s proper perspective we are dealing with the Protestant Reformation, and even more specifically, the very Gospel of Jesus Christ itself. 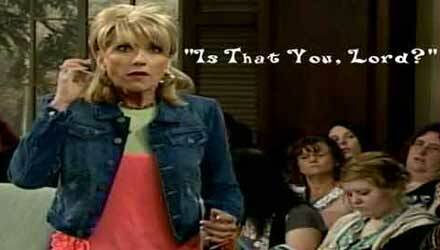 It’s not about whether I like Beth Moore or not, it’s about the very message the Church is here to proclaim. 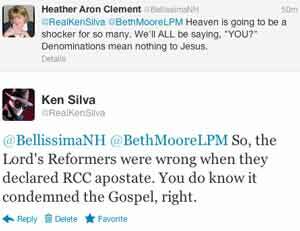 If the RCC is to be considered Christian, then the Reformation was a horrible mistake. 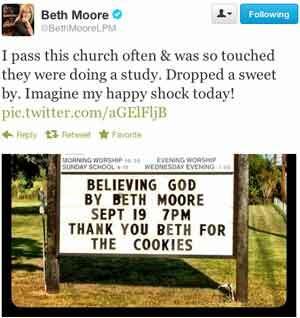 Seriously; are we to believe somehow Beth Moore is beyond reproach and God’s inspired Apostle Paul, who wrote half the New Testament, was not — Now these Jews were more noble than those in Thessalonica; they received the word with all eagerness, examining the Scriptures daily to see if these things were so (Acts 17:11). Notice God called these people noble who were diligent to make sure what was being taught to them in the Name of the Lord truly was of God. 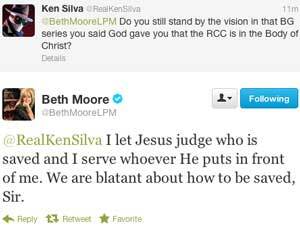 When someone tells you they’ve received a direct revelation from God that runs counter to Scripture and flies in the face of His Reformation we must judge it, even if it’s SBC darling Beth Moore. 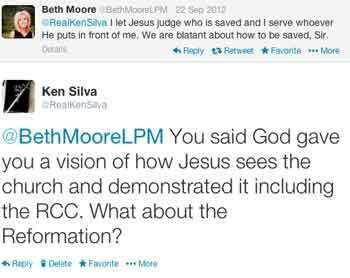 As I close this, for now, I’ll show you that Moore exhibits terrible discernment. 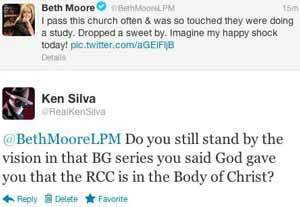 Shame on the SBC that they actually host this online themselves; and what is more, the SBC—the largest Protestant denomination in the United States—even charges money for people to be taught the following demonic deception from Beth Moore. Being that this LifeWay-sponsored BG Online Bible Study is from 10 years ago, we are safe to assume that what you’re about to hear from Beth Moore is in line with the SBC’s nebulous principles which is about as close as you get to actual SBC doctrine. Its Idol of Autonomy is a convenient escape hatch from confronting false doctrine.